The benches currently in the Capitol Rotunda were used in the chapel at Saint Elizabeths Hospital for many years. The photo above shows the benches in the chapel, which was decorated for Christmas circa 1896. 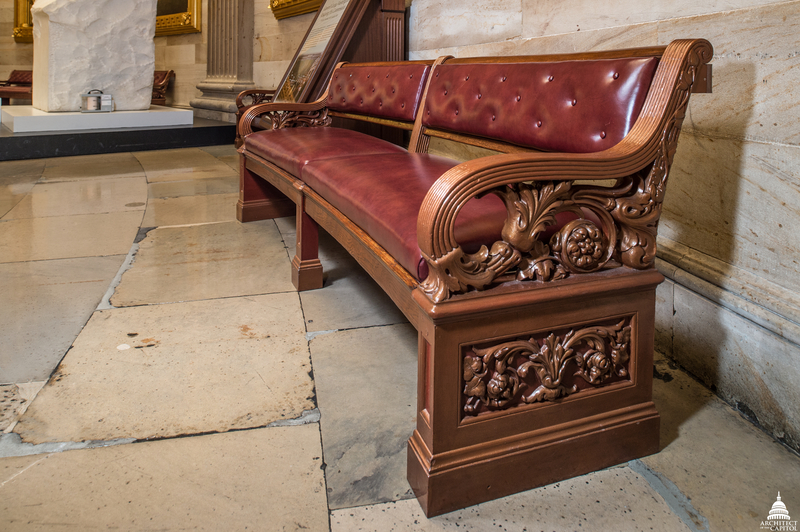 The AOC cares for the benches in the Capitol Rotunda whose cast-iron supports and arms were based on a design sketched by Constantino Brumidi in 1859. Forty-eight benches were cast by Janes, Beebe & Company and given a "Florentine bronze" finish by the Capitol Paint Shop. Capitol carpenters constructed the wooden sections of the benches of American oak. The benches in the Rotunda were originally designed for use in the Hall of the House of Representatives, and they were installed there in 1859. The representatives decided that benches would facilitate their communication more so than the desks and chairs that had been in the chamber since 1857. By 1860, however, they had passed a resolution to remove the benches and bring back the old desks and chairs. Thirty-two of the benches were loaned to Saint Elizabeths Hospital for use in its chapel. Sixteen went to the Supreme Court, which in turn lent them to the U.S. Court of Claims. In 1929, all of the benches from the Court of Claims were returned for use in the Rotunda. In 1973, when additional benches were desired for the Rotunda, Saint Elizabeths could only locate six of its original 32 benches to return. Mystery surrounds the missing benches – along with why the benches were loaned to Saint Elizabeths in the first place. According to AOC Curator Barbara Wolanin, there was a connection between the two institutions. Both the Capitol and the Center Building at Saint Elizabeths, which housed the chapel, were under construction at the time the benches were crafted. And Architect of the Capitol Thomas U. Walter was working on designs for both of them. "Thomas Walter might have suggested the loan of the benches since so many were no longer needed in the Capitol," said Wolanin. From the time Saint Elizabeths opened its doors in 1855, addressing patients’ spiritual needs was an important aspect of their treatment and recovery. According to Jogues Prandoni, a volunteer historian at Saint Elizabeths, the chapel played an important role in hospital life. In addition to providing space for religious services, it also was used for educational and recreational assemblies, with the Rotunda benches providing much-needed seating for the hundreds of patients and staff who were required to attend. As the campus grew, however, the third-floor chapel became less convenient, especially for those patients with physical disabilities. Sometime between 1939 and the opening of a new chapel in 1956, religious services were moved to a small room in the basement of another building. "Since it was 100 years before anyone at the Capitol asked for the return of the benches, they probably weren't considered very important," said Wolanin. "Some were even left outside in the weather." One of the Brumidi-designed benches in the Rotunda today. The benches currently in the Rotunda are moved periodically to accommodate special ceremonies or for floor cleaning. Wolanin and Museum Curator Jennifer Blancato worked with a contracted furniture conservator to develop special platforms and handling carts to move the benches without damaging them or the floor. In 2006, the benches were moved from the Rotunda for off-site restoration that included restoring the cast-iron supports for the benches with a metallic finish that replicates the original Florentine bronze. Periodically, the conservator attends to the benches to address dust, hand oils, losses to coating layers, and the worst annoyance of all, chewing gum. Basic maintenance and conservation is done on-site and takes about a week. At the present time, two of the benches in the Rotunda are reproductions made when the Architect of the Capitol decided in 1975 to place two benches under every painting. The other 14 are originals from 1859. Three of them still contain the original Florentine bronze finish under layers of paint. When the benches were restored in 2006, exposures of the original layers guided the modern finishes. "People didn't always care about the preservation of historic furniture like the Rotunda benches, which is probably why so few were returned from Saint Elizabeths," speculated Wolanin. "But now, we all know that we have a responsibility to take care of these extraordinary objects. Everyone in this building can make a difference in preserving its history." Cover photo above is courtesy of: National Archives and Records Administration. I found this article about the Capital Rotunda Benches by accident and it was so interesting. I used to come to Washington Northern Va. many, many times. Love the city.